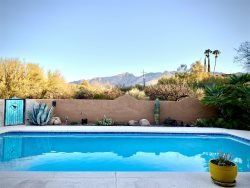 With the Santa Catalina Mountains as a dramatic canvas and the bustling city of Tucson spread out below, residents of Skyline Villas enjoy a location where everything is within easy reach including a sparkling pool and hot tub. The neighboring intersection of Campbell Avenue and Skyline Drive offers entertainment, shops, services and dining options. Skyline Villas offers refashioned open-plan condominium homes with resort-style amenities such as a lighted tennis court, a fitness center, and a community BBQ. Spacious, bright single-level and townhome-style plans, designed to suit your dynamic lifestyle, combine comfort, convenience and livable design go along with an inviting clubhouse. Scroll down to view available Properties for Rent at Skyline Villas.